He explained to me that it’s a little different in consulting. It wasn’t his words, but how he said them that helped me to realize that we were now both wasting our time continuing the interview. I had just botched it by mistaking business travel with pleasure travel. The idea of consulting appealed to me as I considered career options in my last year of college. I can’t even remember how I became aware of consulting. The variety appealed to me the most. Going from client to client, doing different things in different places sounded naïvely cool to me. Fortunately, I honed my interviewing skills and was hired by a small consulting firm. I worked as a computer programmer for them. I did like the variety of working at different clients and working on new projects every few months. I learned a lot about consulting the same way I learned to interview: by screwing up. And after four years of experience there, I had learned enough that I was able to get a job at one of those top tier firms. As I look back on it, I’m not sure that my GPA was high enough to be considered for a top tier firm right out of college. I am sure that my maturity level wasn’t. Every consulting firm has its own process for recruitment, so it does little good to provide a specific recipe for a how-to guide on getting hired into a specific firm. But most consulting firms have similar approaches to recruitment. Consulting firms categorize their hiring into two categories: College hires and experienced hires. College hires are usually found through job fairs at colleges while experienced hires are found through standard recruiting efforts. However, there are college students hired through traditional recruiting efforts. And some experienced hires can be found through job fairs. Regardless of how a candidate is found, firms are looking for certain characteristics. Firms know that someone just graduating right out of college is not going to have much, if any, experience. Consulting firms try to hire the best of the best. That’s an ambiguous term. But firms set their standards for what they look for and usually get high-caliber people. They start out looking only at top universities. Those universities are harder to get into because they strive to accept only “the best of the best.” While a high GPA doesn’t indicate that someone will be a great consultant, it is one of the early filters large firms use to pare down the list of applicants to a manageable group. They will want the student to have served on at least one industry-related internship. They will probably ask more questions about that experience, what you have learned and how you can apply that to being a consultant, than anything else on your resume. They will also look to see if you have done anything that would prove your leadership skills. Did you volunteer for any charitable organizations? If so, did you lead people on any projects? If you were on any athletic teams or in a fraternity or sorority, they will ask if you took advantage of any opportunities to lead. If you held a part-time job during college that’s a bonus. It’s even better if you have dealt with customers. As a consultant, you will work with clients. The ability to deal with demanding clients and develop relationships with them is critical to success as a consultant. Although a high GPA is important, firms don’t just want someone who is book-smart. They want someone who can think on their feet. Interviews can become intense, sometimes with multiple interviewers shooting questions at you to see if you can handle pressure situations. They are also looking for someone who has excellent communication skills. Someone who can think clearly under pressure is a good indicator. If that person can answer questions clearly and succinctly at the same time, it is an added bonus. If you are interviewing with a group of people, they may ask you to give an impromptu presentation on the whiteboard on a subject you are familiar with. All of this will show them whether you have self-confidence. They want self-confidence, not arrogance. Self-confidence is having the confidence to tell them what you know and saying “I don’t know” when you don’t. Arrogance is a ruse for someone who lacks confidence. They can tell the difference. Depending on your internship experience and major of study, they will want to know your subject matter knowledge. College graduates with an undergraduate degree don’t usually get the same grilling that an MBA would get, but they want to know what you know. Much of the same applies to experienced hires. The firm is most likely talking to you because you have some specialized knowledge of a specific industry. They will delve into your knowledge of that industry to see how it can be applied in a consulting environment. But industry knowledge won’t matter if you lack confidence and can’t think on your feet. If they don’t feel that they can put you in front of a client, they will take a pass on you. The working culture of a consulting firm is often different from the culture of a non-consulting company. One of the major differences is dealing with clients. Most consultants work with clients on a daily basis. A consultant needs to understand that he is there for the client. Client satisfaction is a top priority. Knowing how to act and communicate in front of the client is a critical success factor. While dealing with clients, consultants should always have in mind the concept of developing more business. If the project you are working on uncovers additional needs the client has, it is an opportunity to help the client resolve that issue and bring more business into the firm. If you have friends and colleagues that talk about their business issues, that represents more opportunities. This is not just a way to make more money. It is a way to help both organizations become more successful. When consulting firms interview experienced people, they look for their ability to deal with clients and develop more business, in addition to their knowledge of an industry. There are other differences in consulting that firms will want to make sure job candidates will be able to endure. Consulting can sometimes require extensive travel. They don’t want to hire someone and then find out he is a single father who can’t travel during the week. Working hours are sometimes different. Some industries follow a strict 40-hour week. Consulting is usually project based and may require people to work late and over weekends when projects get to critical points. Much of what the above items come down to is basic professionalism. While it is important to practice professionalism in any industry, consulting – particularly the top and middle tier firms – hold a much higher standard of professionalism. They charge their clients high hourly rates. Those clients expect consultants to act and perform to a higher standard. One of the most important things a candidate should do before considering working for a consulting firm is to do extensive research on the firm. What type of consulting do they do? How do they rank in their industry? What tier are they in? The top tier? The middle tier? Are they a small boutique firm that specializes in one industry? Research how they are viewed within their industry. Find out who their executives are and the career paths they followed to get there. How many locations do they have? Does each location have a focus industry? By learning about the firm, you can better determine if this is an organization you would like to work for. You can also make yourself better prepared to interview with them. In this day and age of casual dress, it is still considered appropriate to wear a suit to a consulting interview. If a suit is considered too much, the recruiter or your host will let you know in advance. If there is any doubt, a suit is almost always appropriate. All of the basic etiquette should be followed for an interview. As with any type of interview, it is important to be on time (ten minutes early). Make-up, jewelry and any other accessories should not stand out. You should be the star. If the answer to both of those questions is yes, you will most likely advance to the next level. They are both intangible questions though. If the interviewer simply has a bad gut feel from the conversation, she may answer yes to one or both of the questions. 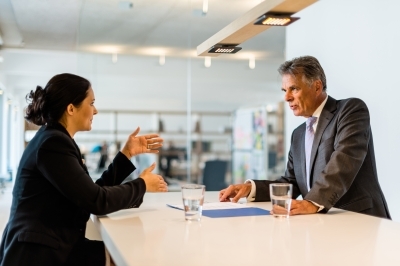 Many consulting firms use case interview questions. This usually includes providing the candidate with a business problem. These scenarios are often pulled from their experiences with actual clients. The candidate will be given time to write notes, ask questions, and analyze the situation. The candidate is then expected to present a solution to the issue. There are books and websites that provide frameworks for the various types of case interview questions. If you expect that type of interview, study up on those frameworks to become familiar with the types of questions and the ways they can be addressed. If possible, partner with someone to practice them in a role-playing situation. Wear a suit and act as though it is an actual interview. In most case interviews, the final answer is mostly irrelevant. There are many answers that could resolve the issue. The interviewers will be more interested in the questions you ask, the assumptions you make, and the process you go through to solve the problem. Getting in to consulting is a major career decision. If you are considering such a move, you should do your due diligence to make sure that it is an industry for you. It is also important that you select a firm that best fits your experience and personality. Every firm has its own practices, business approach, and culture. Finding an appropriate match can be the difference between success and failure. Pretending to be someone you’re not just to get the job will only come back to burn you in the future. Preparation for an interview is also a critical step. Learn as much as you can about the firm and identify the areas that make you the best match. Focus on those common areas to market yourself and to make yourself attractive to the hiring firm. Why are you considering getting in to consulting?